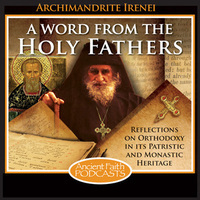 In this week’s broadcast, Archimandrite Irenei offers a reflection on a selection of sayings of St John Chrysostom on the pastoral nature of fasting as an act of charity. In what sense does our fast minister to our neighbor? Brothers and sisters, today a few brief words on fasting from our holy father among the saints, John Chrysostom. These are timely topics to be addressing today: fasting and asceticism. As in the new week, or in fact, later this week, those who follow the old calendar of the Orthodox Church will begin the fast leading to the Nativity of Christ. And for those who follow the new calendar, this fast is already underway. So, whichever calendar one follows by the blessing of one’s bishop, the fast is upon or nearly upon us. But what is fasting? In the Orthodox Church, we fast regularly. Every week of the year, with few exceptions, have days dedicated to this task. Certain seasons throughout the year are appointed as specifically fasting seasons. Most obviously: Great Lent, but also this Nativity Fast, the Fast of the Dormition, the Fast of the Holy Apostles, and the fasts before various feasts. It behooves us, then, to ask not just once or twice in our lives, but regularly, what is this fasting and why do we do it? And here, the fathers, the saints of the Church, have much to teach us and continually to remind us. Saint John Chrysostom in one of his pithy sayings, simply states, “Fasting of the body is food for the soul.” And this short saying puts everything in the right perspective. Fasting, in some sense, is a bodily, spiritual exercise. We refrain from certain foods. We keep longer vigils. We dedicate more time to prayer. We alter our diet. We perhaps take less sleep. It is also an act of our bodies in their normal day-to-day motions. We may refrain from certain social activities and dedicate that time instead to prayer, alms-giving, or to other such spiritual things. But in all these cases, we utilize by the direction of the Church, our physical body, our material nature as something sacred, some which, when focused upon, when cleansed and purified, has the power to transfigure our spirit, our soul. Our body is a sacred gift, and yet through our gluttony, through our misuse of the body, not by its own limitation, but by our misuse, our disfigurement of this sacred gift. The body all too often serves to weigh down the soul, to weigh down the Spirit, to keep it from the spiritual ascent, rather than doing that which it was created to do, which is to assist us in our spiritual growth. And so, says Saint John, we fast in order to strengthen the soul by cleansing the body, by giving the body back to the spiritual contest, by offering it back into the realm of the Christian life, reclaiming it from our sensual passions, from our ordinary misuse of the flesh, to that which may draw us closer to God. So, fasting is a tool by which our bodily natures are reclaimed and reunited to the spiritual. And for this reason, as we enter upon the Nativity Fast, we must take blessed attention towards our body as well as our soul, uniting them together in the ascetical project. And yet, we must not become conceited, focusing solely on ourselves. We fast in order to reclaim creation, to offer this world which we have disfigured through our sin back to God, and our fathers teach us that we must begin this project in our own heart. For if our own heart is weighed down, we can no more lift another up than we can ourselves. And yet, the project of working on our heart is a pastoral project, a missionary project. For when our heart is restored to communion, when we are lifted up ourselves to God, we are able to do the same to the cosmos, to the world around us. So fasting, though it focuses inward on the heart, is nonetheless an act of charity, of love, of giving to the other in this world. And this is constantly reminded to us by the fathers. It is one of the reasons that almsgiving is tied into fasting, and when we fast, we deliberately engage in acts of charity, reclaiming not only our body, but our time and our activities back from our selfish preoccupations into an orientation aimed at the other, at all of creation. In that light, hear these words of Saint John. “Do you fast?” He asks. Then feed the hungry, give drink to the thirsty, visit the sick, do not forget the imprisoned, have pity on the tortured, comfort those who grieve and those who weep. Be merciful, humble, kind, calm, patient, sympathetic, forgiving, reverent, truthful and pious so that God might accept your fasting and might plentifully grant you the fruits of repentance. Do not say to me, I fasted for so many days. I did not eat this or I did not eat that. I did not drink wine, that I endured want. Instead, show me if thou, from an angry man, has become instead gentle. If from a cruel man, thou hast become benevolent. If thou art filled with anger, why oppress thy flesh? If hatred and avarice are within thee, of what benefit is it that thou drinkest water instead of wine? Do not show forth a useless fast, for fasting alone does not ascend to heaven. Let this be our reminder as we engage in the fast leading us to the Nativity according to the flesh of the Lord Jesus Christ. Let us not engage in what St. John calls “a useless fast” which attempts to ascend to heaven by its own merits, its own power, repeating the sin of the people of the Tower of Babel. Let us instead use the fast as the Church intends and the fathers instruct: as a time to work out our transformation by God’s grace. What sacrifices we make, let them be sacrifices that transform us. They are not ends in and of themselves. They are the tools by which we can become a little closer to God’s image, a little closer to Christ’s life. Let us use the fast as a time of charity, of love, of meekness and ultimately, have great and unending joy in the incarnate and risen Lord. Through the prayers of our holy fathers and the saints, John the Golden-Mouthed of Constantinople and of all the saints, Lord Jesus Christ our God, have mercy on us and save us. Amen.